THIS IS QUITE interesting… English actor, broadcaster and Twitter kingpin Stephen Fry is currently learning the cúpla focal for a special role in TG4′s Irish-language soap opera Ros na Rún. The station confirmed to TheJournal.ie this morning that the QI host will shoot the scenes at the programme’s Spiddal-based set early next month. Fry, of course, has a well-publicised interest in Irish literature, being a scholar on James Joyce and Oscar Wilde – and played the latter in a biopic. He also recently produced a book of Wilde’s short stories. The Connacht Sentinel reports today that Fry plans on perfecting his west of Ireland dialect when he arrives in Galway in December. It is believed that Mr Fry was completely taken with the idea of an Irish language soap and was thrilled when he was not only invited onto the set, located in Spiddal village, but to take a part as ‘a special extra’. Scripwriters have written a small speaking part for the Englishman and from this week, Mr Fry will be learning his Irish script though he will be touching up on his accent when he actually gets to Galway. The Norwich City board member will first play golf at the Connemara Islands GC in Eanach Mheain before a visit to Ros a’ Mhíl harbour and then on to the Ros na Rún set. 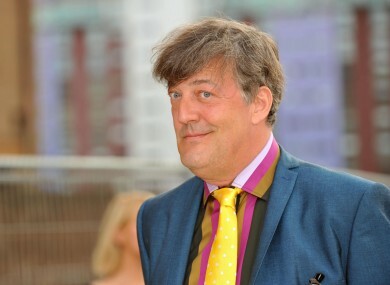 The show’s series producer Hugh Farley said work is underway in anticipation of Fry’s arrival. There is huge excitement here on the Ros na Rún set regarding Stephen Fry’s cameo appearance for the show. Our team of scriptwriters are currently writing Stephen a cúpla focal for his special role and we plan to film a highly-entertaining scene with Stephen and some of Ros na Rún’s best-loved characters. Filming is slated for Monday, December 6 and possibly Tuesday, December 7. Email “Stephen Fry learns Irish for part in Ros na Rún”. Feedback on “Stephen Fry learns Irish for part in Ros na Rún”.